Noah Dau joined Synergy Global in Feb 2014, as a Marketing Intern & is now a Team Leader for Design, Innovation & Communications, which reports directly to Heather-Jane Gray, the Chief Executive. 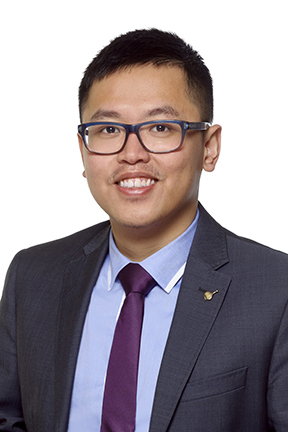 Noah has made his family proud by graduating from the prestigious Monash University, AUS & is passionate about developing his career as a ‘Strategic Marketer/Graphic Designer’ & a prominent Illustrator. In 2013, he assisted the Chairman of the Ocean Energy Development Group (OEDG) based in Ho Chi Minh City, Vietnam in a meeting with Carnagie Wave Energy (CETO), based in Perth, WA, Australia. Noah’s duties included the logistical arrangements (travel/accommodation), plus interpretation between both parties & document management. Additionally, working as a Graphic Designer will not only take his marketing skills to the next level, but also give him more flexibility to work creatively. With this new equipment, he can perform desktop publishing, plus produce more sophisticated & professional graphic design work - including Posters, Banners & Website Design. He also extends his grasp with Branding & Promotion, which allows Noah to become flexible in organising strategic creative direction for campaigns, events, & so much more. The combination of Marketing & Design work is ideal for Noah, as he’s naturally both a strategic & creative thinker, with an appreciation for high aesthetic & ethical standards. This makes his document presentation more interesting because they tend to be less conventional & more visual. The creative use of graphics is particularly appealing in today’s world, when people are ‘time poor’ & need to understand complex issues quickly to make informed decisions. Being an international student, Noah has proved his independence & flexibility, by learning to study & work in a completely new environment. By engaging in Melbourne’s cultural ‘melting pot’ he regularly meets people from all backgrounds – this has enabled him to learn how to comfortably communicate & work with a wide range of people.